Peter’s footing was made sure upon the billows serene as his sight was fixed upon the gleam in Jesus’ eye. The storm surged as the world would turn and he lost his gaze of faith. The fear of concerns ever loomed, he would be consumed and doomed to the depths, as the master’s arm outstretched would wrest his disciple from the rage and then the grave. For the storm did abate the moment Peter was safe upon the frail crafts weathered worn planking. The master was at the rail and at his side, for the storms of the world would churn, and wait their turn. 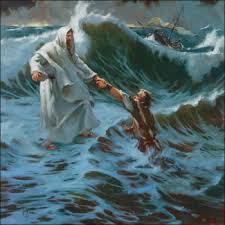 For there are no more tears and waves disappear when my savior draws near. Jesus abide with me it is even tide. Posted on December 21, 2012 at 3:27 pmI wish to show my gratitude for your geetiosrny for men and women who require guidance on this important concept. Your personal commitment to getting the message across has been definitely informative and have constantly made men and women much like me to realize their dreams. Your personal interesting publication means this much a person like me and extremely more to my fellow workers. Thanks a lot; from all of us.